Sunday afternoon, the Carolina Hurricanes threw everything they had at the San Jose Sharks. The forecheck was strong and the offensive opportunities were numerous. However, despite outshooting the opponent 45-19, the Canes lost the game 2-0. It was a disappointing result for a well-played game, and one that has turned a November that started out with such hope into yet another month where Carolina has let points slip away. Sunday’s result against San Jose would have been more disappointing, if it weren’t so predictable. San Jose started rookie goaltender Troy Grosenick, playing in his first NHL game. He finished the night with his first NHL shutout. Full credit to the young player, because he certainly made the saves when the Sharks needed it, but the end result was almost inevitable, given Carolina’s struggles in milestone games. Grosenick joins a long list of goaltenders that have earned a shutout against Carolina in some milestone event. Either their first NHL start, first start at home, first start with a new team, whathaveyou. For whatever reason, the Hurricanes seem almost eager to provide the platform for a new goaltender to become a hero…at least for one game. Eddie Lack was that hero in December of last year. Lack had beaten Carolina in Raleigh just a little over a week earlier, but he earned his first home start as a member of the Canucks that day. One would believe that the nerves would get to a young goaltender, playing in front of the home crowd for the first time, but Lack showed none. He stopped 11 shots in the first period and made spectacular saves in the second to preserve a 1-0 lead. He finished the night with 31 saves on 31 shots, earning the first star of the game. Carolina’s head coach Kirk Muller felt his team didn’t test Lack as much as they could have. Tweener goalie Kari Ramo received the shutout gift from the Hurricanes just a month later. After failing to find a job in the NHL, Ramo spent years in the KHL before the Calgary Flames signed him to a deal last year. Though he struggled to adequately fill the backup role for the Flames, he played like a Vezina winner in a January game against Carolina. Ramo earned his first NHL shutout that game, and the Flames earned their first shutout victory in 117 games. Even established goalies seem to find their mojo against the Hurricanes. 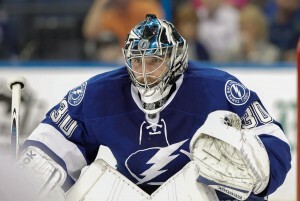 In 2013, Ben Bishop was involved in a high-profile trade that saw him move from Ottawa to Tampa Bay. His first game in a Lightning uniform could not have been scripted better. Once again, Carolina controlled the play and generated a great number of shots, generating 16 shots in the first period and 45 shots overall, but once again, they found themselves with zilch at the end of the game. Unfortunately for the team, this has been going on for years. In the 2010-2011 season, both James Reimer and Michael Neuvirth earned their first career NHL shutout in games against Carolina. Head coach Paul Maurice had a similar message after both games. One could almost set their clock by it. Over the past five years, Carolina has been shutout 18 times. Almost half (eight times) have earned some milestone for the opposing goaltender. Many have come in “slump busting” games as well. Either Carolina enters the game on a winning-streak (a rarity in the past five seasons) or the opponent enters the game on a long losing-streak. The end result is always the same, with a giant goose egg on the scoreboard. While the end results may be predictable, the Hurricanes always seem to find new ways to accomplish it. They have been shutout two times in this season thus far, and stats at the end of each game could not be more different. In a 2-0 loss against San Jose, Carolina outshot the Sharks 45-19, and controlled the play for most of the night. It was a sharp contrast to their only other shutout loss this year, a 5-0 loss to Calgary. In the Calgary game, the Hurricanes only put up 16 shots and never appeared invested in the game. This does seem to match up with the pattern over the past five seasons. In the 18 shutout losses, the opponents have outshot the Canes 10 times, while the Hurricanes have outshot their opponent eight times. Much like the team itself, Carolina’s performances while being shutout have been consistently inconsistent. What may be most concerning for Canes fans is the comments from head coach Bill Peters after Sunday’s loss. Peters is the third coach in a row that seems to be able to identify why the team struggles offensively at times, yet when it comes to correcting those struggles, the lessons appear to fall on deaf ears. While Carolina certainly doesn’t have the biggest players on their roster, they do have many players that have shown the willingness to park themselves in front of the net in the past. But when facing a hot goaltender, the simplicity of that strategy seems to be discarded in favor of making the perfect passing play, a strategy that Carolina, quite simply, does not have the talent on the roster to accomplish. Every team runs into a hot goalie throughout the course of the season. Simplicity is often the way to beat a goalie on his game, and it’s often a lesson that the Hurricanes forget.